In early April, Field Marshal Khalifa Haftar, one of the most powerful leaders in conflict-divided Libya, was treated for an unspecified ailment at a military hospital near Paris. The strongman of eastern Libya disappearing for over two weeks triggered a flurry of speculation, death rumors, and political jockeying ahead of a presumed succession. On April 26, Haftar returned to Benghazi in a media-friendly comeback that could not have been more reassuring for his supporters. But the commander’s recovery—and the violent posturing he may pursue to show strength—will not fully restore his narrative. Haftar’s centrality and relevance were already diminishing prior to the incident. Now that the health hiatus made them more visible, the pre-existing trends may accelerate. These shifts stem from the interplay between domestic rivalries and foreign powers’ attempts to influence them, an intricate back-and-forth that has dominated Libya for the past seven years. 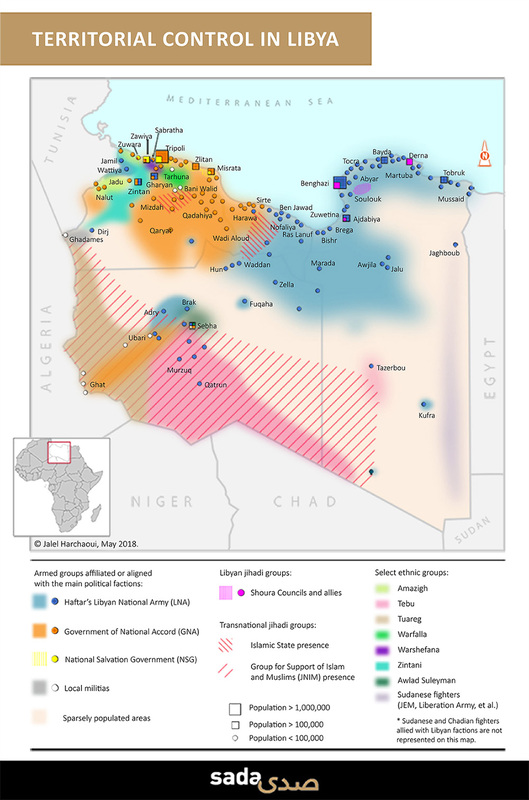 As early as mid-February 2011, when social protests morphed into an armed uprising against the Qaddafi regime, external actors interested in influencing Libya’s fate grappled with a shortage of institutions and structures through which outside parties could help shape outcomes easily. Compounding the issue was the international community’s disagreement from the outset regarding how to handle post-Qaddafi Libya. The UAE participated in the NATO-led intervention because it saw it as an opportunity to help establish a new, conservative Sunni Arab dictatorship grounded in a Libyan military and susceptible to Abu Dhabi’s influence. However, Muammar al-Qaddafi’s Libya did not have the robust army the UAE and other anti-Islamist actors required for this vision. Meanwhile, Qatar participated in the same NATO-led coalition in order to turn Libya into a showcase of what a post-Saud Sunni country ought to resemble. Doha’s strategy, soon supported by Ankara and a few others, was to bet on political Islam as a means of implementing that revisionist agenda. However, unlike in Tunisia or Egypt, political Islam never commanded a wide base among the Libyan public. This basic lack of popularity partly explains why Libya’s Islamists often have, in lieu of peaceful politics, felt compelled to resort to brute force since 2011. Khalifa Haftar, who worked for Qaddafi as a senior army officer until 1987, understands all of this well. In 2011 he began crafting a narrative that would help propel him to prominence. In May 2014, the commander launched Operation Dignity and, within weeks, his militaristic, maximalist endeavor had garnered the support of many Libyan factions, business moguls, former officers, as well as foreign states—including the UAE and Egypt. Haftar disseminated the notion that Libya already possessed a full-blown army, like Jordan’s, Syria’s, or Algeria’s; it just had to be remobilized under his leadership. However, Libya’s army, which Qaddafi had deliberately weakened for decades, requires a vast, painstaking overhaul and a willingness to compromise that Haftar does not possess. Another hallmark of his discourse was his refusal to distinguish between radicals and moderate proponents of political Islam. The conflation was a way to elicit the support of governments hostile to Libya’s moderate Islamists but geographically removed from and indifferent to Libya’s physical security crises and threats. Domestically, a loose definition of terrorism also enabled Haftar to co-opt regional, socioeconomic, and tribal grievances that had little to do with radical Islam. The storyline worked. As long as the Operation Dignity kept seizing additional territory, it managed to unite all those with a grudge against Islamists. But Haftar’s rise stalled in July 2017 after he prematurely announced the complete liberation of Benghazi. The declaration backfired politically over the subsequent weeks. Some leaders of the Awagir, a major tribe indigenous to the Benghazi area, began more overtly to voice their criticisms of Haftar, his sons, and other members of the Furjani tribe at the helm of the field marshal’s armed coalition, whom they accused of assassinating and imprisoning tribal leaders. Separately, the already tense relationship between Haftar’s army and Cyrenaica’s civilian politicians in Tobruk and Bayda over who should have the biggest role in rebuilding the local economy was also becoming more contentious. These internal tensions illustrate the difficulty which Haftar’s armed coalition has in maintaining its political legitimacy in Eastern Libya once the war of conquest stops. By declaring Benghazi liberated in July, Haftar made his foreign backers—the UAE, Egypt, France, and Saudi Arabia—more impatient for him to capture the country’s most crucial quadrant, northwestern Libya. During the preceding months, militias unwilling to pledge allegiance to Haftar and aligned with the GNA had succeeded in expelling Islamist and other hardline figures from strategic territories in northwestern Libya, such as Tripoli’s downtown area. And despite their continued preference for Haftar, the field marshal’s foreign sponsors were pleased with the progress made by the GNA-aligned militias in the capital and its surroundings. In September 2017, an Egyptian army committee chaired by the armed forces’ chief-of-staff, Lieutenant-General Mahmoud Ibrahim Hegazy, said that it would help oversee a nationwide reunification of Libya’s armed forces—anxious to make tangible headway on the Libyan file ahead of President Abdel Fattah el-Sisi’s bid for reelection. Although the Egyptians indicated they would regard Haftar as the new institution’s head, their forum was opened to “all parties excluding terrorist organizations,” signifying their determination to see a unified set of armed forces covering all of Libya, not just Cyrenaica. They started by including GNA-aligned military figures known for their practicality, such as General Abdelrahman al-Taweel, Major-General Usama al-Juwaili, and Colonel Najmi al-Nakua. After a personnel shuffle in the Egyptian Ministry of Defense in October that saw General Mohamed Farid Hegazy appointed the new armed forces’ chief-of-staff, Egypt’s Ministry of Foreign Affairs seized the chance to instill more flexibility into the mediation talks. Under the increased influence of diplomats, Cairo became somewhat more inclined to follow a horizontal, network-based approach to Libya. France and the UAE, both of which work closely with Egypt on Libya, followed suit. The change in attitude meant that the principal foreign states interested in seeing an Islamist-free Libya were now dealing with interlocutors not aligned with Haftar, thus diluting the notion that he alone can fix Libya. During Haftar’s absence in April, the UAE, Egypt, France, and Saudi Arabia discussed and considered various Eastern Libyan alternative candidates who could stop Haftar’s armed coalition from disintegrating.1 For instance, no serious decision about succession could be envisaged without a preliminary greenlight from the Saudi leaders of the transnational Madkhali movement, which denounces all other forms of political or jihadi Islam. In eastern Libya, these rigorist Salafis form a vital component of Haftar’s forces. Also during Haftar’s absence, militia leaders from northwest Libya—including Abdelraouf Kara of Tripoli’s Special Deterrence Force and Haithem al-Tajouri of the Tripoli Revolutionaries Brigade, the city’s largest militia—were invited to Riyadh and other foreign capitals. Tripoli’s most powerful militias, affiliated with the GNA’s Ministry of Interior, are still not formally included in the Cairo talks. But direct invitations from state actors, no matter how unofficial or discreet, boost the confidence and arrogance of Libyan actors who see them as proof of greater international recognition and are therefore become less willing to compromise. Anything that helps Tripoli’s militias entrench their hegemony over the city’s police and economic institutions increases the probability of a potential battle in the Greater Tripoli area. Now, in order to reinvigorate his reputation as Libya’s military savior, Haftar is likely to make dramatic moves against his declared enemies, and also against potential rivals or successors within his own camp. The prospect of elections by the end of 2018 only adds to the pressure on the presidential hopeful. Already, less than two weeks after his return, on May 7, Haftar launched a land and air operation into the Islamist-held city of Derna, which his forces have besieged for almost two years. Wresting the city of 100,000 from the militant armed groups will probably cost time and blood. If that new front does not produce the desired effect, there are many other hotspots across the country into which Haftar could be tempted to throw his military weight. The ongoing clashes in the southern city of Sebha present just one example. As Libya’s civil war enters its fifth year, one aspect hasn’t changed since the conflict broke out: exclusionary postures that rely on force as the main justification for political dominance still offer rewards to armed players. As long as that is the case, there will continue to be a risk of dangerous escalations in the country’s east, west and south. Haftar’s maneuvering notwithstanding, it will be difficult for him to avoid becoming universally perceived as a military commander who struggles to hold the East, let alone enter northwestern Libya. This in turn will make some players in northwest Libya and elsewhere more ambitious and intransigent. Foreign states with sway in Libya can help lower the tension by being less impatient and by carefully examining how their combined influence distorts Libyans’ incentives. Jalel Harchaoui is a Ph.D. candidate in Geopolitics at Paris 8 University. Follow him on Twitter @JMJalel_H. 1. Interviews with the author, April 2018.